They were Mac-Mc-O’-less surnames but it’s reckoned that eight signatures (three by birth) to the United States Declaration of Independence were of Irish descent. Twenty-two American Presidents and some seventy million people can claim an Irish birth right – over half are American. So it’ll be no surprise to learn that golfers too, whether Irish, Irish American or Scots Irish American, left their mark on the history of golf in the US whether it was because of, or in spite of, their Irish gene. Recently William Gibson’s research traced the origins of the Curragh Golf Club back to 1854 and replaced Royal Belfast as Ireland’s oldest golf club. Golf only began taking off in Ireland since the formation of the Royal Belfast G.C. in 1881 as much of the play in the Curragh confined largely to military personnel. The number of golf professionals was by the early 1900s beginning to follow suit with the growth in the game. 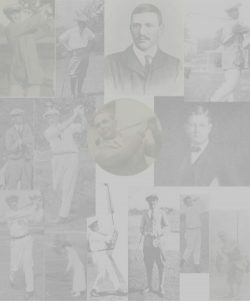 While Jim Larkin and James Connolly mobilised the Irish working classes leading up to the 1913 lockout likewise the golf professionals tried to improve their conditions with the institution of the Irish Professional Golf Association (“IPGA”) in June 1911 but in truth it probably did little to improve their lot. Despite this the migration of Irish born golfers to America in the first quarter of the twentieth century was a rarity but a few brave souls sought passage to the New World settling mainly in New York, Massachusetts and Pennsylvania. The last piece of Irish soil emigrants destined for America would see is Fastnet Rock (“Ireland’s Teardrop”). One such emigrant was Patrick J. Doyle, nicknamed, the Smilin’ Irishman, a granduncle of Eamonn Darcy, the star of the 1987 Ryder Cup at Muirfield Village. Common folklore has it that the late arrival of Doyle’s train to Queenstown (now Cobh) saved him from boarding the S.S. Titanic but if it did he clearly didn’t get the next boat either as the following month he was runner-up (despite a three-stroke lead and a course record by the halfway stage) to Michael Moran in the 1912 IPGA Championship either that or he had one hell of a commute. Upon his arrival to the US he was engaged as resident professional at the exclusive Myopia Hunt Club in Massachusetts, a frequent venue for the US Open at the turn of the twentieth century. Doyle first made his presence felt by qualifying for an ‘Irish Open’ championship at Portmarnock G.C. only to be beaten by Ted Ray by 3 and 2 in the first round of matchplay. Doyle was an accomplished golfer capable of shooting low scores and despite being a back-marker qualifying for the US Open at Brookline C.C. in 1913, a 73 on the third round vaulted him up the field finishing in tenth place earning him the princely sum of US$ 20. In 1916 Doyle lost the Massachusetts State Open to Mike ‘King’ Brady, a first generation Irish American. Doyle was a successful teaching professional and tutored William Howard Taft, the first US golfing president, Joseph Kennedy, Jack Dempsey, and Joe Louis. President Woodrow Wilson commended Doyle for his efforts raising money at golf benefits during WWI, his playing career stopped around the time of the Great Depression and he died on 29 March 1971 at 82 years of age after a long illness at the Mount Vernon Hospital. Another golfer to seek the fair land was John Edmundson, a native of Portrush, emigrated in 1913 on board the Merion and joined the Country Club of Lansdowne and Llanerch County Club. John was the younger brother of James Edmundson, the 1907/08 Irish Professional champion, and appears to have played little competitive golf in Ireland but did enter for the 1912 Irish Amateur (Close) while playing out of Bushfoot G.C. and managed to beat H.M. Cairnes the 1907 champion leading a golf correspondent to suggest the winner from his third round match would win the championship as it turned out it was prophetic unfortunately as it was his opponent Craig who eventually took the honours. The 1911 Census lists his occupation as night porter. The older brother, James, joined him in 1921 after seeing action in a World War I artillery division and was engaged as a professional at the North Hills C.C. Two years later he would win the Pennsylvanian Open and was runner-up in the 1925 and 1927 East Falls Open and was one of the founding members of the Philadelphia Section PGA. James’ son Jack was mayor of Aldan, Pennsylvania for seventeen years where there is a park named after him. Peter O’Hare was the first of the O’Hare (or O’Hara as it became known Stateside) brothers from Greenore G.C. to emigrate in 1915 and was engaged by Haworth GC then followed by Shackamaxon C.C. where he was joined by his brother Patrick, the reigning Irish professional champion in 1919, in the Spring of 1920. Later Patrick joined the Richmond County C.C. but not before the two brothers joined forces to record an incredible 6 and 5 victory over Vardon and Ray at Shackamaxon C.C. – the year Ray took the US Open title at Inverness by beating Jack Burke Snr, more of him later. The year before Patrick left for America he had taken James Braid to the twenty-fourth hole before succumbing to defeat, now he had gone one step further against another member of the triumvirate. His crowning glory was victory in the 1922 North and South Championship at Pinehurst and involved, according to Grantland Rice, the pre-eminent sports journalist of the time, “winning a big championship twice from a field that included Hagen, Barnes, Hutchison and some of the finest professional stars in the game.” Winning the championship twice was a reference to his sensational 69 in hurricane conditions, but later the round was cancelled as the water wasn’t draining quickly enough leaving the course unplayable, and Paddy had to start all over again to secure his victory (‘What I can do today I can do tomorrow’). Following this Paddy returned to Ireland ostensibly for a two-week vacation but never returned and in 1927 was coaxed to playing in the IPGA Championship, which he won by nine strokes throwing in a course record for good measure. In fairness to Paddy the whole idea of Prohibition was completely anathema to his lifestyle to which regular lubrication was a prerequisite. Peter was not as accomplished a player but was no slouch either, in the 1917 Western Open Championship to he finished fifth behind Barnes and Hagen and was runner-up in the North and South Championship in 1921. The name McKenna is synonymous with the birth of professional golf in Ireland, John J. (or Johnnie) McKenna arrived in New York in April 1913 for a short duration but after WWI he returned again and was engaged as resident professional Belleclaire Golf and Country Club in Long Island. Johnnie, a much sought after teaching professional, fell on hard times during the Great Despression and returned to Ireland in 1933. Johnnie’s brother James was one of the first Irish-born golfing professionals and a founding member of the IPGA. There were others Tom Boyd was born in Armagh, Northern Ireland, despite his delightful “Dublin Brogue”, Jimmy Law another early arrival in 1910 from Coleraine, County Antrim and Eugene (‘Gene’) K. McCarthy probably the earliest  of the Irish immigrants to eventually turn professional Stateside. Another Boyd this time from Glengormley was not a professional golfer but no less passionate about the sport. Stephen Boyd (aka William ‘Billy’ Miller) played the role of Masala in Ben Hur and the CIA agent on board Proteus in the Fantastic Voyage but his abiding passion was golf and he died unexpectedly doing exactly that. At this juncture including the leading lady from the Quiet Man, Maureen Fitzsimons (aka Maureen O’Hara), would be opportunistic and self-serving purely by virtue of her holding, in her ninetieth year, the President’s position at Glengarriff Golf Club. Of the amateurs golfers Mrs Nonna Barlow, a native of County Waterford, emigrated Stateside in 1898, twice a finalist in the US Ladies’ Amateur Championship at Merion G.C. and the Essex County Club and proved a near invincible force in her home state of Pennsylvania. Another export was Captain Ernest F. Carter, a two-time Irish Amateur Champion and considered one of the best golfers in Great Britain and Ireland in the early twenties took passage on the ‘Baltic’ in 1923 – many consider his non-inclusion on the 1922 Walker Cup side to play at the National Golf Links of America a travesty of justice. As for golf course architects probably Arthur Vernon Macan (“Mac”), the Trinity law graduate, who emigrated to Canada in 1908 but made his mark as an amateur golfer and course designer across all of North American continent. Continuing to play golf off a four handicap despite losing his left leg below the knee in WWI went on to design some great golf courses. Needless to say the successes of the Irish American golfers are far more prominent; Ben Hogan, John J. McDermott, ‘Slammin’ Sam Snead and Francis Ouimet can be included in this category. John J. McDermott the brilliant, irascible and, as it turned out, unstable double US Open Champion became the first US born winner of the event but whose playing days ended in 1914 after which he convalesced in various mental institutions and rest homes. The legendary Ben Hogan’s (“The Hawk”) genealogy traces his family’s settlement in Mississippi from Ireland, his great-grandfather was born there in 1847. Other Irish American’s like Michael Joseph (“King”) Brady, Thomas (“Tommy Mac”) L. McNamara and his brother Dan, the caddie-master and future professional at the Brookline C.C., play their part in Mark Frost’s, The Greatest Game Ever Played, with the lead role going to Francis Ouimet (the ‘David’ that slew ‘two Goliaths’) whose mother, Mary Ellen Burke, was born in Belfast. Tommy Mac would surely have been crowned first American to win their native championship had he not collapsed from heat stroke while three shots ahead and in sight of the finish line. The diminutive Eddie Lowery, Ouimet’s famous caddie, amateur golfer, golf promoter (notably the careers of Ken Venturi, Tony Lema and Harvie Ward) and future millionaire, was of Irish descent as was Fred Corcoran the last line of whose golf hall of fame bio reads, ‘Fred Corcoran was golf’. Henry Chandler Egan was a second generation Irish American on his father’s side who in 1904 won the US Amateur Championship at Baltusrol G.C. and the silver medal in the Olympic Games and later became a golf course designer. The Kerrigans’ Tom and George deserve a mention; the former had the distinction of playing the first ever shot in a USPGA championship at his home club, Siwanoy C.C., in 1916 and finishing third in the 1921 Open Championship at St. Andrews. Keeping with the family theme there was the Burkes’, Jack (christened John) and his son John (Jack jnr. ), the USPGA and Masters champion, Jack was second generation Irish American his grandparents were both Irish (probably natives of Cork) but his mother and father were Scottish and American respectively. Their story was told by Curt Sampson in Golf Dads; who else would have the chutzpah or the mischief to offer Palmer a gift of a spectators’ rope and tell him he belongs on the other side of it. Then of course there’s Johnny Farrell from White Plains, NY, who defeated Jones in a play-off for the 1928 US Open Championship at Olympia Fields CC, and whose parents arrived in the US from Ireland in 1892 and settled in New York, his brother James was also a professional golfer. Then you have the Walsh family of twelve (at least four John, Martin, Frank and Patrick jnr. were to turn to professional golf) whose parents Patrick and Mary settled in America in 1896. In 1932 Frank lost the USPGA in a playoff with Olin Dutra. Keegan Hansen Bradley in 2011 at the Atlanta Athletic Club in Georgia joined the ranks of major winners with an Irish ancestral background. His great grandparents left Ballycotton, Co. Cork for the New World and their children taught Keegan’s Dad, Mark, the game in New England before he joined the professional ranks and is now PGA Head Professional in Jackson Hole, Wyoming. Mark’s other sibling Pat Bradley, Keegan’s aunt, was a six time major winner on LPGA Tour and won three of the four majors in the same year. Pat was inducted into the World Golf Hall of Fame in 1991. There were others like John T. O’Shea the professional at Kernwood Country Club in Salem, Massachusetts and much later there was Mark O’Meara, whose great grandfather left Irish shores to seek a better life, as did John Daly’s ancestors while David Feherty’s bloodline oozes green, as does his irreverent and rapier wit. Ireland on the north-westerly corner of Europe, an Island two-thirds the size of the State of Pennsylvania, literally a drop in the Atlantic Ocean, is now punching well above its weight as G-Mac, McElroy, Harrington, Lowry and Power are just chomping at the bit for their first or next Major. Dare we dream that another Major (maybe something august, green, single-breasted and tailored this time) is in the offing? Since we started with US President’s with Irish roots it should be noted that some of the Presidents played golf to varying degrees including: Woodrow Wilson, JFK, Nixon, Ronald Reagan and Barack Obama. George Bush senior and junior can claim Irish links. Bill Clinton claims to have Irish roots and who would deny him it given what he has done for the island of Ireland and the Adare Manor and Ballybunion Golf Clubs.